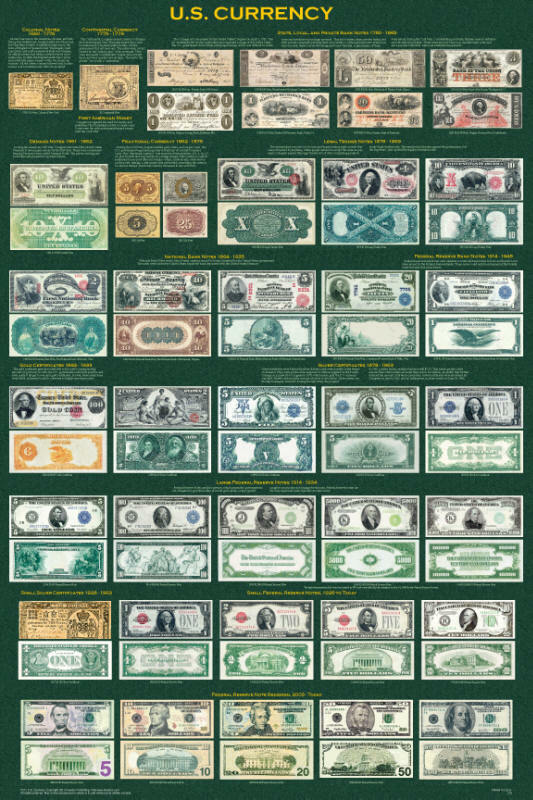 This poster summarizes the history of American paper money. The top row begins by showing a banknote issued by one of the colonies. It is followed by an example of Continental Congress currency used to finance the Revolutionary War. The United States Government did not begin to print currency until 1862. During the interim, private banknotes were issued by states, cities, individual banks, and even private companies. Eight of these appear in the top row. The rest of the poster is devoted to official United States Government currency. Many great designs were used before the introduction and adoption of the modern-day greenback design.